^ 松本ほか 1994, pp. 39-43. ^ 石川 2013, pp. 166-176 §付録 石油無機起源説による国産資源論. ^ 松本ら 1994, pp. 73-100. ^ 松本 2009, pp. 73-100. ^ Wang, Zhiyuan; Sun Baojiang (2009). “Annular multiphase flow behavior during deep water drilling and the effect of hydrate phase transition”. Petroleum Science 6: 57–63. doi:10.1007/s12182-009-0010-3. 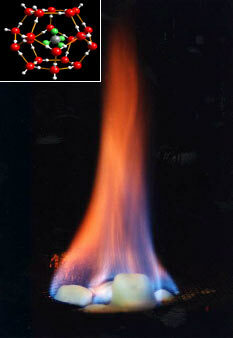 ^ US Geological Survey, Gas hydrate: What is it?, accessed 21 March 2013. ^ Roald Hoffmann (2006). “Old Gas, New Gas”. American Scientist 94 (1): 16–18. doi:10.1511/2006.57.3476. ^ 鳥海光弘; 田近英一 (1996年). 地球システム科学. 岩波書店. p. 22-37. ISBN 4-00-010722-4. ^ 青山 2013, pp. 106-107. ^ 松本 2009, pp. 72-75. ^ 松本 2009, pp. 55-56. ^ 青山 2013, pp. 101-104.